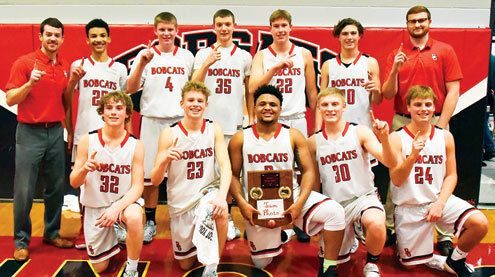 The top-seeded Bowling Green Bobcats were able to hold on for the 50-48 victory in overtime over the (2) Van-Far Indians and collect the championship hardware at the 94th Annual Bowling Green Tournament last week. The Bobcats ended the first period with a 7-5 edge behind buckets from Kaleo Dade, Kameron Worley and Michael Starks. Van-Far got on the board with baskets from Trey Miller and Dillion Minor. Bowling Green expanded their lead in the second quarter as Worley notched five and got a pair of baskets from both Austin Callahan and George Niemeyer. Caden Wilburn drained a three and the Indians got points from Verlyn Johnson and Miller but came up short in the second, 16-8. Bowling Green led 23-13 at halftime. The Indians came out hot in the third and made up ground fast as Miller sank three field goals and went 3-3 at the charity stripe. Van-Far also got a pair of baskets in the frame from Caden Wilburn and Verlyn Johnson as they outscored Bowling Green 19-11 in the quarter. The Indians took their first lead of the game with just over two minutes remaining in the third despite baskets from Gavin Deters and Starks. Bowling Green led 34-32 going into the final frame. The lead changed seven times in the fourth quarter as the teams battled to the buzzer. Michael Starks was nails from the free throw line for the Bobcats in the fourth. He tied put the Bobcats up with a field goal and was 5-6 from the free throw line to keep Bowling Green on top as time dwindled. A three-pointer by Verdell Johnson tied the game at 46 points each. Caden Wilburn also hit a trey and the team got buckets from Verlyn Johnson and Miller in the quarter. It appeard the Bobcats would win in regulation on a bucket by Dade but he was called for a charge and the points were wiped from the board. In the overtime period, Gavin Deters put the Bobcats up by two and added another point at the free throw line. Starks also hit another free throw to help secure the lead. Verlyn Johnson hit a field goal in the period, but Van-Far was unable to get any other points on the board. Starks led the way for the Bobcats in the championship game and was 9-12 from the free throw line to earn the Community State Bank TribCast Player of the Game. Scoring for the Bobcats: Worley, 9; Niemeyer, 8; Deters, 7; Dade, 5; Callahan, 4. Dade and Worley were named to the All-Tournament team for their efforts throughout the week. Dade earned the MVP designation. Miller led the way for the Indians with 15 points and was also named to the All-Tournament team. Scoring for Van-Far: Caden Wilburn, 14; Verlyn Johnson, 11; Verdell Johnson, 6; Minor, 2. In the championship game the Bobcats narrowly out-rebounded Van-Far, 34-29 and was slightly better in the paint, 32-30. Coach Brandon McCann said the team had a specific game plan against each opponent through the course of the tournament. He said that against Van-Far it was to be as perfect as possible. McCann added it was also about making smart decisions on both sides of the floor. McCann pointed out that against Silex in the opening round, the plan was to be fluent in the offense and pressure on the defense. Against Elsberry the Bobcats wanted to take away their post and make shots for Elsberry as difficult as possible. McCann was proud to win the tournament in his first year back at BGHS. He offered his thanks to the staff, workers, administration and community for helping to put together another exciting tournament this year. Coach Pat Connaway noted the Bobcats were ready from the start of the championship game and his boys appeared to be shell-shocked. He added the team continued to struggle in the secondand frustration started to set in. Connaway said the team talked about turning up the defensive intensity and letting the defense create some easy buckets in the locker room at halftime. He noted the third has been a good quarter for the Indians all season and it was necessary to get back into the game. “Verlyn was able to get some steals which led to some easy buckets and Caden and Trey started asserting themselves on the offensive end and pulled us within two at the end of three quarters,” he said. Connaway pointed out the Indians had a shot at the win but an open shot at the buzzer by Verdell Johnson wouldn’t fall. He noted that having to foul for possession in the overtime period and couldn’t regain an edge. He said the team once again had a chance to win, but came up short. “We pushed the ball up the court and called our last time out with four seconds left on the clock trailing by two. Coach Reading drew up a set and we had a couple kids open, but the pass got deflected and time ran out before we could get a shot off. It was a tough loss and a hard-fought game,” he stated. Connaway said he was proud of the boys’ effort and the way they battled back from an early deficit in the game. He added the immediate attention will be turned to the home game tonight (Tuesday, Jan. 29) against Montgomery County. 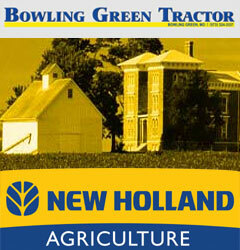 Find more on the Bowling Green and Van-Far semifinal games on page 8.